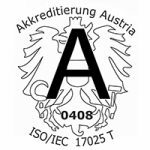 CoLT successfully completed the audit according to ISO / IEC 17025 and has now received the official accreditation as proof of its testing competence from the Bundesministerium für Digitalisierung und Wirtschaftsstandort, Department Akkreditierung Austria. The examiners rated the quality standards as “exemplary”. For the demanding fulfillment of ISO standards, we have comprehensively analyzed and documented our work processes. This ensures transparency of the individual work steps within the company and subsequently enables measurable quality. The implemented quality management system helps to identify and meet customer needs by structuring and optimizing business processes across the enterprise.